Gaza: When Will the Guns Fall Silent? 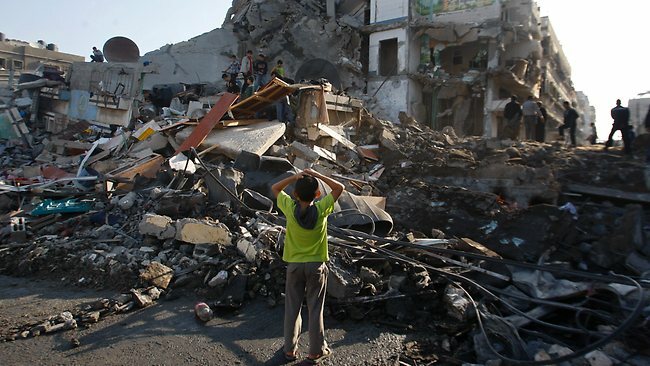 With Gaza no longer in the headlines, it may seem as if nothing ever happened there. But for the eight days of Israel’s latest assault on Gaza, we all discussed the futility of declaring victory for either side, because so long as innocent civilians died and the possibility of such attacks recurring remained, there could be no real winner. We were angered by Israel’s deliberate targeting of civilians, children and journalists, wondering how their deaths would strengthen the security of the Jewish state. We were outraged by Israeli commentaries on ways to ‘handle’ Gaza, questioning if such perceptions could be those of a people who wanted peace with their neighbors. We were taken aback by the parallel war on social media and the fact that Palestine’s supporters won the “Twitter war,” providing if only a moral victory to the cause and a clearer reflection of global sympathies in the conflict. We were not surprised by the predominantly pro-Israeli coverage of the attack throughout the world, though a number of news outlets came across to break through some anti-Palestinian misconceptions. But we also refused to believe that the Palestinians couldn’t rely on anything other than an Islamist-based militant group to protect its citizens in Gaza and ease their suffering. After eight long and bloody days, the guns finally fell silent in Gaza and rockets no longer shook its Mediterranean blue skies. 150 Palestinians and 5 Israelis dead later, what seemed like a long hellish dream was over. Or was it? Each and every time hostilities erupt between Israelis and Palestinians, the same pleas propagate in the aftermath: the need for both sides to contain violence because it only increases tensions instead of sowing trust; the need for the West to stop turning a blind eye to Israel’s daily humiliation of the Palestinian people in almost every single sphere of their daily lives (including social, economic, humanitarian and geographic). There is the need for Arab countries, despite their other national concerns, to make a genuine commitment to solve one of the longest running conflicts in modern history, instead of using it for their own narrow, strategic and sectarian interests. While the biggest need remains that of the Palestinian leadership itself, whether in Gaza or the West Bank, to work for the sake of its own people. More often than not, Palestinian leadership has been one of the greatest enemies of the Palestinian cause, Yasser Arafat being the best example of a leader – who by building his own personality cult, embezzling million and sowing the seeds of strife in countries on the basis of which to build his own – brought nothing but greater despair to his own dispossessed people. So for as long as the same pleas are to be reiterated, the long hellish dream would have not been over for neither side. Whether for the Palestinians in search of their long-lost homes, or for Israelis as they struggle with the consequences of having forced millions out of their land for a land of their own. And with the current ceasefire in place and its call for easing Gaza’s blockade, it may sadly seem as if Palestinians are given no choice but to resort to their swords and not their words, to get any concessions in alleviating their plight. But what chance is there for a sustainable peace and decent living for all sides, and what chance is there for long-thought stability in the Middle East and the end of the use of the Palestinian cause to suit the needs of a myriad of state and non-state actors, if the guns will never truly stay silent for Palestine?